HUDSON VALLEY, NY – Shoppers preparing for their Thanksgiving celebrations helped kick-off the season of giving by generously supporting iHeartMedia’s Stuff the Bus food drive at five Stop & Shop locations in the mid-Hudson region. The drive, held twice a year, benefits the programs and partners of Catholic Charities in Dutchess, Orange, Sullivan, and Ulster Counties. 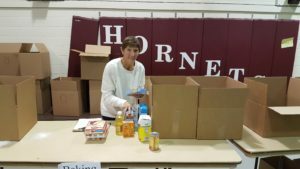 This year, the November drive, held the weekend before Thanksgiving, collected 21,635 pounds of non-perishable food and other basic household items. iHeartMedia radio personalities, staff, and volunteers spread word of the food drive to shoppers at Stop & Shop locations in Newburgh, Hyde Park, Hopewell Junction, and two in Poughkeepsie. They helped load donations onto full-sized school buses provided courtesy of Gallagher Bus Service/Leprechaun Lines, as well as vehicles provided by Friendly Auto Group and the Dutchess County Driving School. The buses delivered the food to a team of Catholic Charities staff and volunteers who unstuffed, sorted counted, weighed, and repacked more than 11,000 food items to prepare them for the recipient food pantries, soup kitchens, parishes, and other Catholic Charities’ partners in the four-county service area. The Thanksgiving Stuff the Bus food drive collected the equivalent of 17,972 meals. Consistent with previous years, the most commonly donated food items were canned fruits and vegetables, soup and other canned meals, pasta, and breakfast cereal. “While many of us have the good fortune to celebrate Thanksgiving with turkey and all the fixings, food insecurity is a very real problem for many of our friends and neighbor,” said Chuck Benfer, iHeartMedia Market President “For the past 21 years, we have been thankful for the generosity of those who have made Stuff the Bus a success. The Thanksgiving 2018 food drive could not happen without our iHeartMedia family and Stuff the Bus partners, including Stop & Shop, Gallagher Bus Service/Leprechaun Lines, Claudio Cares Foundation, Foam & Wash Car Wash, People’s United Bank, Viking Industries, and the shoppers who give so generously,” added Benfer. Volunteers included students from Marist College and SUNY New Paltz, confirmation class students from St. Patrick’s Catholic Church, Highland Mills, Girl Scouts from Troop 273, Monroe, Knights of Columbus members from Our Lady of Mount Carmel, Middletown, and many local parish and community members. The next Stuff the Bus event will be held in June at Stop & Shop locations in the mid-Hudson region. “Catholic Charities is honored to be the beneficiary of the bi-annual Stuff the Bus food drive,” said Kristin Jensen, Chief Advancement Officer, Catholic Charities of Orange, Sullivan, and Ulster. “We are grateful for the giving spirit of our friends at iHeartMedia, the shoppers, and our team of volunteers who helped move thousands of items in just a few hours. Many hands make light work,” added Jensen. – Ulster County – 845.340.9170, ext. 100. Catholic Charities of Orange, Sullivan, and Ulster, as one of the human service agencies of Catholic Charities of The Archdiocese of New York, is committed to building a compassionate and just society. Catholic Charities serves the homeless, the hungry, the emotionally and physically handicapped, immigrants, and the marginalized and vulnerable of Orange and Sullivan Counties. Catholic Charities collaborates with parishes, Catholic, and non-Catholic partners alike to help people of all religions who are in need. For more information, visit www.cccsos.org. Cutline 1: Pat Schiskie, of Port Ewen, is a dedicated Stuff the Bus volunteer who helps unstuff the buses and repack supplies for area food pantries each spring and fall. 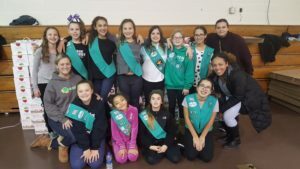 Cutline 2: Members of Monroe Girl Scout Troop 273 spent time giving back to the community by volunteering to help unstuff the buses, sort, and pack more than 21,000 pounds of food at the 21st annual Thanksgiving Stuff the Bus event.